Infused with the flavors of fall, here’s a holiday drink recipe that will keep on giving – Pumpkin Spiced Moonshine. 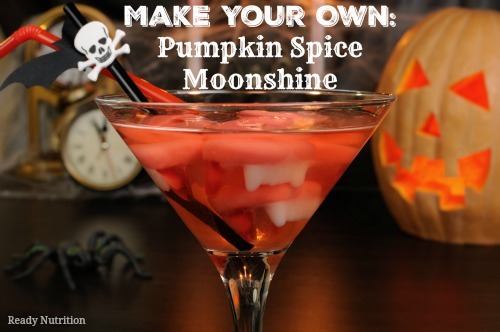 Whether you have made your own moonshine from scratch and want to kick it up a little or go the easy route and purchase some high proof alcohol, this is a great drink to serve at all the adult-centered Halloween parties. 1 can (12 fl. oz.) of thawed frozen apple juice concentrate. In a blender combine pumpkin puree, brown sugar, 1 can of thawed frozen apple juice concentrate. Add mixture to a large pot and add two 2 pints of alcohol. (You won’t be cooking with the pot, I just found it to help mix the contents up better). Remember to drink responsibly and make good choices! Would you let it clear and siphon off the pumpkin puree? I think the flavour would still be there, but it might look better a little clearer, without the pumpkin ‘settlings’. I really like your site, and bookmarked it for future reference! If you want some more recipes like this, I just got a book called “How to Master Moonshine” by Marshall on Amazon. Dozens of recipes on how to make these kinds of liqueurs, whether you actually make moonshine or not.